If you are a fan of The Simpsons, this is a must see and an obvious add to your movie collection. If you are not a fan of The Simpsons, first grow a sense of humor, then go see the movie because you will be a fan after it. If that does not hold true, don’t bother reading anymore of The Movie Mind reviews anymore. OK, that may be a bit harsh, but only under special circumstances should you not find this movie funny, such as: you really are a cartoon character and don’t appreciate the cartoon stereotypes this movie portrays about you, or looking at the color yellow for an hour and a half gives you dementia. Even then, it may add to the comedy in this movie. Look, I’m not going to get carried away and say that it is one of the best movies, or even comedy’s of all-time, but this movie is hilarious and very entertaining. I have long said that The Simpsons has some of the most original, witty comedy around. How else do you explain a cartoon (an f-ing cartoon people!!) sticking around for so long and crossing over such a large spectrum of viewers? One criticism I will offer up is that the movie did not involve or cameo the “supporting” characters as much as I would have liked to see. I am still amazed at the staying power of The Simpsons brand. The Movie Mind was in the prime target market during the start of the show and has stayed a loyal viewer ever since. The writers know their targets too well. I am amazed at how through the years I went from idolizing Bart and wearing the popular “Don’t Have a Cow Man” t-shirts in the early days, to empathizing and truly understanding Homer, not to mention my frosted beer mug and bottle opener with his likeness on it. 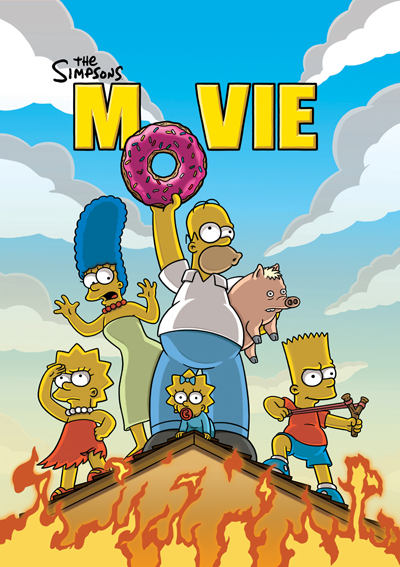 While The Simpsons Movie will not leave us smarter then we came, it will leave us happier and in a better mood. That is more then many movies with “real” actors can say nowadays and its good enough for The Movie Mind. Or is that two, whatever….”Freak”ing hilarious.